Business affairs tend to be conducted in a very informal fashion. A conventional suit will not be required - shirt and tie are sufficient. Government office hours: Mon-Fri 0800-1600. Although Papua New Guinea has been described as 'a mountain of gold floating on a sea of oil', it is a poor country and most of the population is engaged in subsistence agriculture. However, it boasts the largest-known supply of low-grade copper, which accounts for much of its export earnings. Other deposits include gold, chromite, oil and natural gas. Light industry has grown steadily, mostly to meet consumer demands. Papua New Guinea's attempts to develop a tourist industry have been undermined by poor infrastructure and past political instability. The country is also subject to extreme weather and natural phenomena, including drought, flooding and earthquakes. Papua New Guinea belongs to the Asian Development Bank and the South Pacific Commission. It is still dependent on large amounts of aid from Australia. Gold, petroleum, copper, palm oil and logs. Machinery and transport equipment, food and fuels. Australia, Singapore, Japan, China and USA. 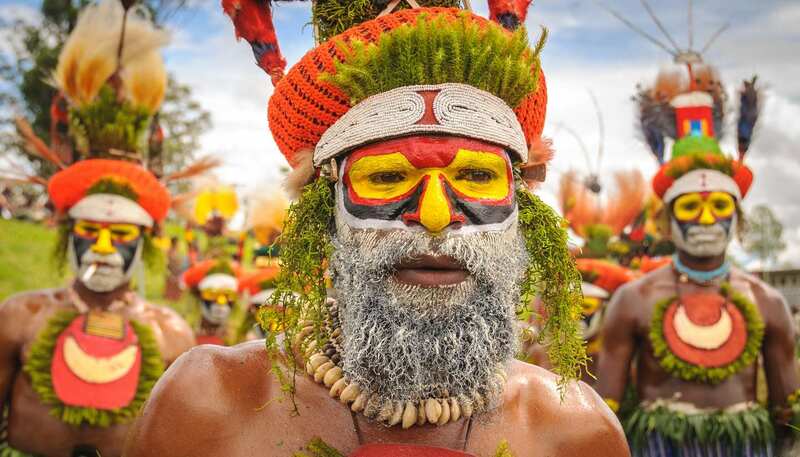 There are no area codes in Papua New Guinea. Services tend to be slow and sometimes unreliable. Two daily newspapers are published in English: The National and Papua New Guinea Post-Courier. The most popular daily is Niugini Nius. For those wanting to watch TV, Commercial channel EMTV is the only broadcaster and hotels sometimes provide satellite channels. Airmail to Europe takes seven to 10 days.